Download "Voice & VAS for Smart People"
4 free toll number the customer service excellence with free call Toll free numbers or those charged to the recipient allow the caller to contact a company or organization at no cost whatsoever. 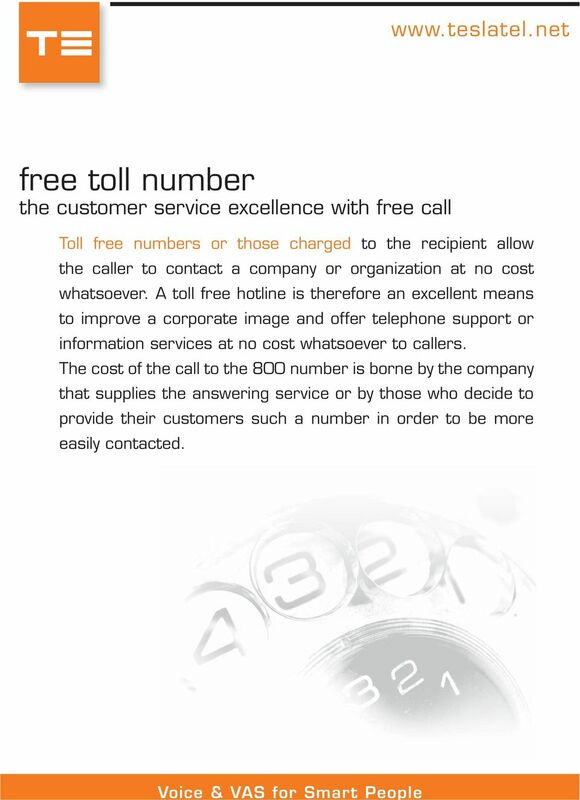 A toll free hotline is therefore an excellent means to improve a corporate image and offer telephone support or information services at no cost whatsoever to callers. The cost of the call to the 800 number is borne by the company that supplies the answering service or by those who decide to provide their customers such a number in order to be more easily contacted. 6 premium number generate business with customer service These Premium numbers (also called Premium Rate Numbers) are those numbers for which the caller incurs a higher cost than that of a normal phone call in order to receive vocal information of various kinds. Our client is someone who, by responding to calls and delivering a vocal service, earns a percentage of the cost charged to the caller. 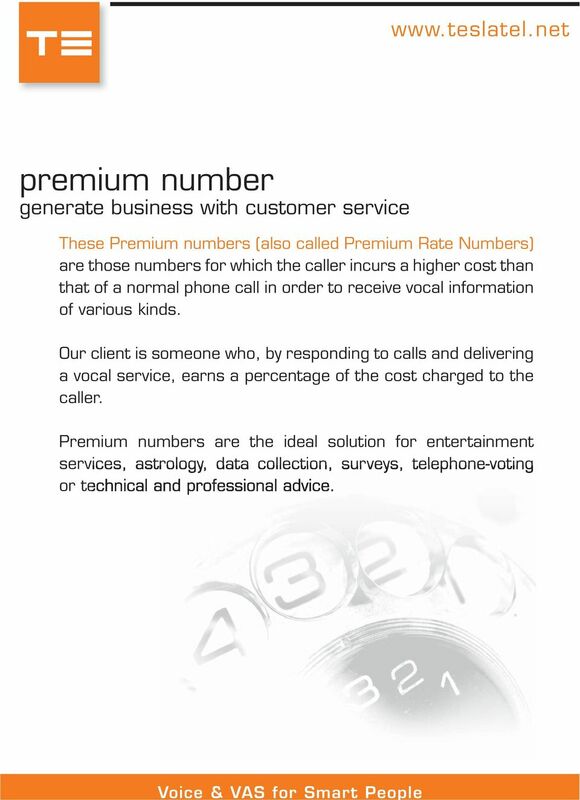 Premium numbers are the ideal solution for entertainment services, astrology, data collection, surveys, telephone-voting or technical and professional advice. 7 business number platform With self service technology for non-experts This service consists in an innovative platform, completely manageable via the web, able to offer intelligent routing for the calls to various destinations with a minimum customer support. 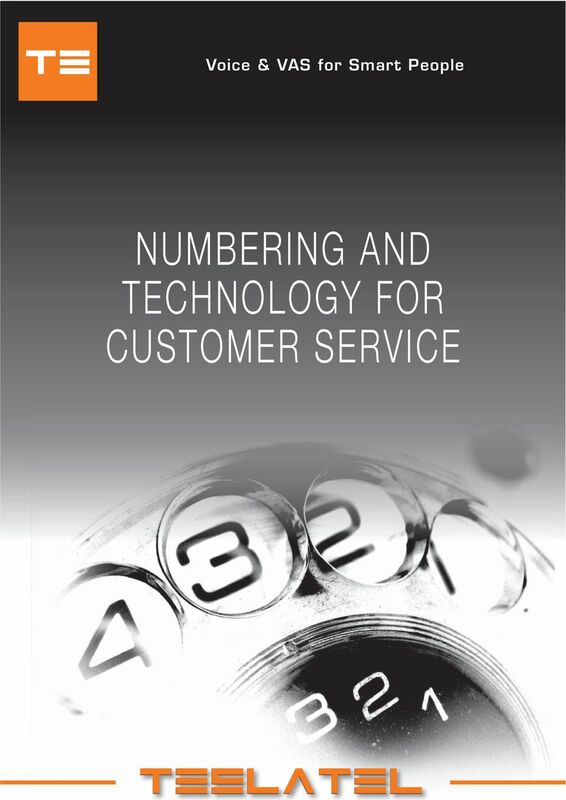 Typically the non-geographic numbers are used to access to a kind of smart services. Once the call is connected, can be routed to different destinations based on different parameters. 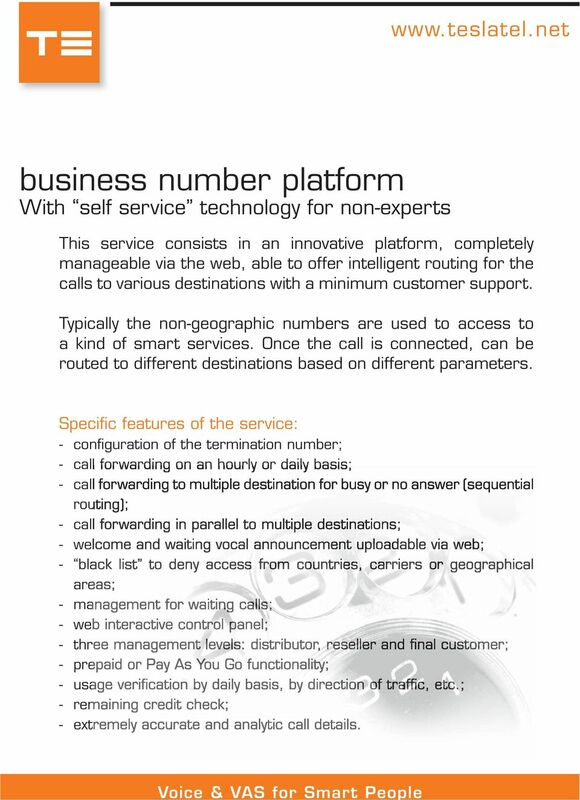 Specific features of the service: - configuration of the termination number; - call forwarding on an hourly or daily basis; - call forwarding to multiple destination for busy or no answer (sequential routing); - call forwarding in parallel to multiple destinations; - welcome and waiting vocal announcement uploadable via web; - black list to deny access from countries, carriers or geographical areas; - management for waiting calls; - web interactive control panel; - three management levels: distributor, reseller and final customer; - prepaid or Pay As You Go functionality; - usage verification by daily basis, by direction of traffic, etc. ; - remaining credit check; - extremely accurate and analytic call details. 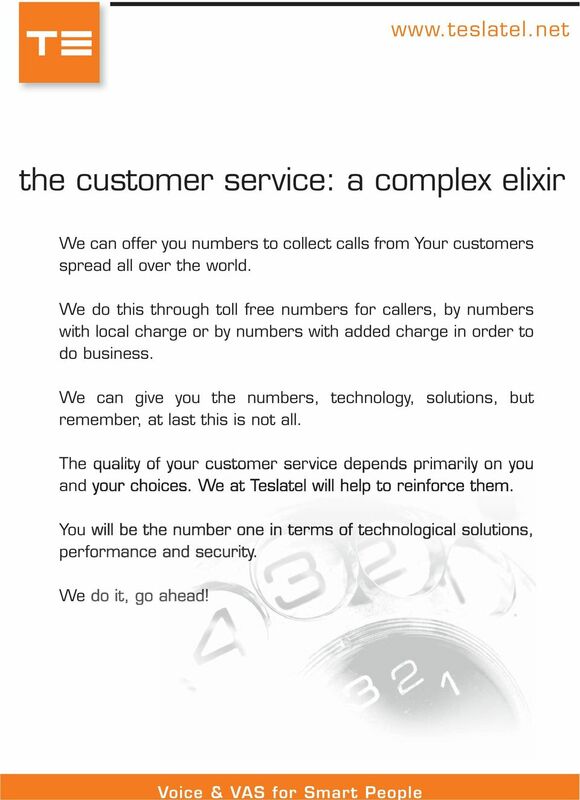 8 the customer service: a complex elixir We can offer you numbers to collect calls from Your customers spread all over the world. 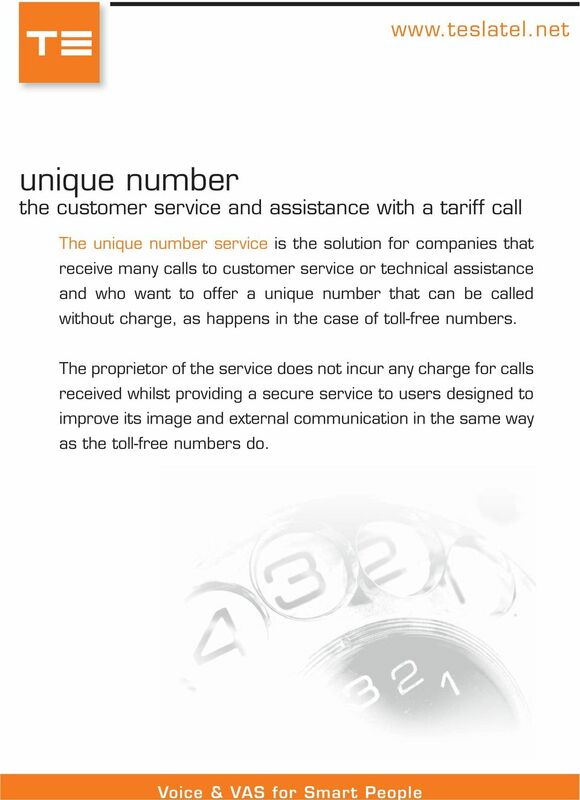 We do this through toll free numbers for callers, by numbers with local charge or by numbers with added charge in order to do business. 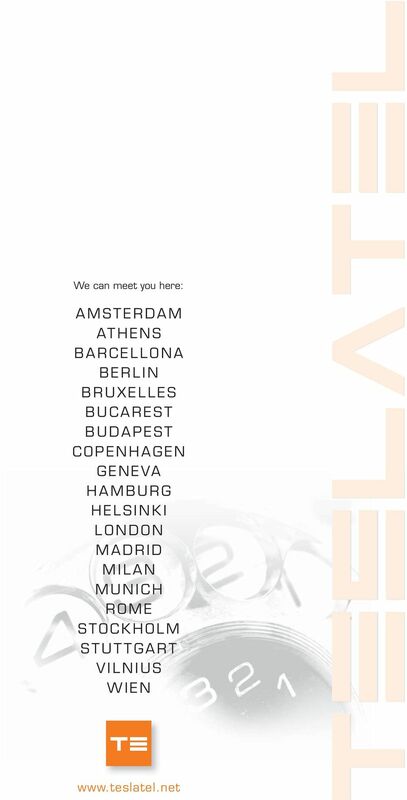 We can give you the numbers, technology, solutions, but remember, at last this is not all. The quality of your customer service depends primarily on you and your choices. We at slatel will help to reinforce them. You will be the number one in terms of technological solutions, performance and security. We do it, go ahead! Control your calls on any number, anywhere, from any device..
ISDN lines (digital lines) are available in ISDN2e & ISDN30e. Prices in the ISDN2e table are for 2 channels of basic rate ISDN2. Customer pricing Voice Effective from August 2014 By offering wholesale PSTN and ISDN lines, Entanet enables you to provide your customers with high quality, reliable telephone lines at competitive prices. Voice Reseller. We can help you deliver high-quality voice services without major investments in network and systems infrastructure. Connect. Simply. Introducing Inteliquent Global interconnection is complex. At Inteliquent, we harness our passion for problem-solving to create simplified solutions for the world s telecommunication challenges.